Dr. Knoedler, a native of Duluth, has practiced and cared for patients in the Twin Cities and surrounding communities since 1989. He is Director of the Prostate Cancer Care Program at St. John’s NorthEast Hospital and an active member of Metro Urology’s Cancer Center. Dr Knoedler has been annually recognized by his peers as a “Top Doctor” in the Minneapolis/St. Paul Magazine. 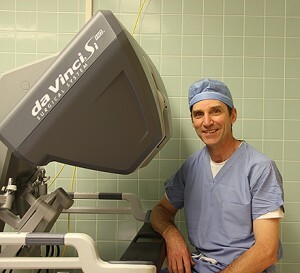 Dr Knoedler is also a recognized Regional Leader in the techniques of Robotic Surgery. He and his partner, Dr. Gaertner, performed the first Robotic Prostatectomy in private practice in the Upper Midwest. They were recently presented with the Thirlby Award by the North Central Section of the AUA for their clinical research on Robotic Prostatectomy. Since May of 2004, Dr. Knoedler has devoted his surgical practice almost exclusively to Robotic Surgery. Dr. Knoedler, and his partner, Dr. Robert Gaertner, have helped lead the nationwide trend towards minimally invasive Prostate Cancer Surgery. To date, they have performed over 4,000 da Vinci Robotic Procedures, helping make Metro Urology’s Robotics Program one of the most active practices of its kind in the country. Request a da Vinci Consult Now!